Horizontal Galvanometer by Robert William Paul circ 1899. Robert William Paul (1869-1943) who had previously worked for Elliott Bros trained as a scientific instrument maker at City and Guilds College in London. He set up in business in Hatton garden in 1891, producing a range of instruments, mostly electrical. In December 1919 his firm was taken over by the Cambridge Scientific Instrument Co and the name changed to The Cambridge and Paul Instrument Company Ltd. The name was shortened to the Cambridge Instrument Co Ltd in 1924 when it was converted to a public company. The above example of this wonderful instrument was in military service as can be verified by the broad arrow stamp followed by the letter I on the base along with the serial number of 208. This is dated on the front edge of the base 1899. There is some damage to the insulation blocks where the terminal screws are mounted but has been carefully repaired. This is a very sensitive instrument and deflects well at below 1 volt. There is a locking screw at the side which when operated lifts the pointer and holds it against the inside the housing to prevent damage. This is an example of a Horizontal Galvanometer made by Elliot Bros of London. It is dated as pre 1916 as this is the date that Elliot Bro became Elliot Bros (London) Ltd. It is almost identical, in design, to that above made by Robert W. Paul. This is not surprising given that Paul worked for Elliot Bros prior to setting up business on his own in 1891. This unit is complete with its leather case and is in perfect working order, a wonderful instrument. This example of a Horizontal Galvanometer was made by Telegraph Works of Silvertown. London. It is in exceptional condition with no marks to either the brass lacquer or the thick bevelled glass. It is in fully working condition including the travel locking mechanism. And is great addition to the collection. Unipivot Galvanometer by Robert William Paul circ 1917. This Galvanometer which is dated 1917 shows the advances in design over 18 years. Instead of the earlier pin pivoting needle and transportation clamp where there is a sliding button on the side which when operated lifts the needle pivot to prevent damage. This model has a pin protruding from the back face that when the instrument is lifted off the table the sprung loaded pin lifts a small cup which supports the moving coil and prevents damage, when placed down it releases and allows the coil and needle to swing freely. The coil moves in a radial magnetic field and is suspended from the top with a spiral coil of silver or phosphor bronze, a coil of similar material forms the other connection to the coil but exerts only a small controlling force. The magnetic circuit comprises of a spherical core which the coil is suspended around and a permanent horseshoe magnet with accurately bored poles, zero adjustment is possible by rotating the spiral suspension, This is a nice example complete with leather case, it carries the military broad arrow stamp which shows it was used by the armed forces during the Great War. Pattern “ L “ Unipivot Galvanometer by Robert W. Paul s/n L721 circ 1915. This early Unipivot galvanometer pattern “L” with a serial number of L721 dates from between 1903 and 1919. On the face it is described as a single pivot galvanometer although it has a Unipivot logo on the circular metal cover of the mechanism which also has a screw turn lock which depresses and operates a clamping plunger witch lifts the pivot and locks it while the instrument is in transit thus preventing damage to the fragile movement. This instrument is rated with a coil resistance of 8.6 ohms at 16 deg C which like all galvanometers is used in calculations where resistance of lines needs to be adjusted for testing purposes. This instrument is housed in a polished Teak case and is in fully working condition. This nice early Cambridge Instruments Unipivot Galvanometer is advertised in the 1927 catalogue as a High Frequency Galvanometer A unipivot millivoltmeter , pattern I used in conjunction with a simple form of thermal accessory consisting of a heater and thermo-junction formed by looping together at their centres two wires 0.05mm diameter, of iron and constantan respectively to form a cross, it is known as a High Frequency Alternating Current Galvanometer. This example has been tested and works, it carries an early number of L199. This galvanometer was manufactured in 1918 at one of the General Post Office main factories at Telegraph Works, Silvertown. London and has a serial number of 4228. This is a twin coil, differentially wound instrument with markings on the back showing a number 50 indicating each coil has a resistance of 50 ohms which is standard with the 1A, and each shunted with a 300 ohm resistance bobbin. On the back face are the 4 milled head terminal screws 2 for each coil, identifying it as a twin coil galvanometer type 1A as opposed to being a Type 22A which is a single coil galvanometer and would have only 2 terminal screws. A current of 17.5 mA through either of the shunted coils should produce a deflection of at least 40 degrees and no more than 50 degrees. A deflection of 30 degrees either to the left or right is achieved with 100 mA when the coils are joined in series so as to oppose each other, and with 200 mA when the coils are joined in parallel in opposition and is done by use of the link plates seen on the terminal screws so various settings can be achieved with this instrument. The 1A Galvanometer was used on all Duplex circuits, high speed and machine telegraphs. Duplex working consists in the simultaneous transmission of two messages in opposite directions over a single wire connecting the two stations. The metal case with its rounded top, I can only guess, is probably for protection given the date it was manufactured i.e. during WW1, after the war, in the early 1920’s the outer cases reverted to polished mahogany. On the top face of the rear bar is a stamped mark of the broad arrow indicating that this instrument was in service with the armed forces. The colour of the re-painted cover also backs this up. G.P.O. Single coil Cathedral Galvanometer Type 22A. circ 1920. 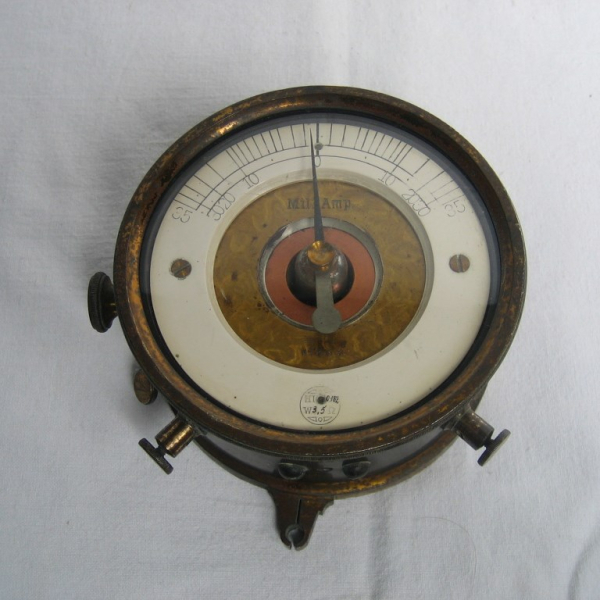 This is a single coil galvanometer type 22A and is in great condition for its age standing 5 ½” wide 2 ¾” deep and 7” high. No manufacturer markings are visible only 30 over S stamped on the back indicating coil resistance of 30 ohms. On the back face are 2 cheese head terminal screws identifying it as a single coil galvanometer as opposed to being a Type 1A which is a differential galvanometer and would have 4 terminal screws. This was formerly termed as a single coil galvanometer and was in its earlier forms fitted with ivory stop pins to limit the swing of the needle. The needle should normally be vertical when facing either north or south and should deflect to either stop pin with a current of 9.3 mA. In the later patterns, like this example, the stop pins are omitted with the dial being fully engraved. In addition a 1000 ohm non inductive shunt is placed across the coils to reduce the inductance of the instrument. The coils are joined to the two cheese headed contact screws at the back of the wooden case. The 22A galvanometer is used on simplex sounder and central battery circuits. This example is in full working condition. This rare example of an early field galvanometer is in wonderful condition for its age and is in perfect working order. It was manufactured by Siemens Brothers London between 1865 and 1880. We can date this instrument between these dates due to the fact that a Siemens & Halske sales agency was established in London in 1850 but by 1858 was converted into an independent company and named Siemens Helske and Company but by 1865 was renamed Siemens Brothers of London. This remained the case until 1880 when the company was converted into a stock company and became Siemens Brothers & Co Ltd. On the back face of the black painted case is a small button which when depressed releases the front and top faces, including the coil mechanism and separates them from the rest of the case allowing access to the windings for repair. This is a wonderful example of an early instrument in original condition. This galvanometer is in wonderful condition and works perfectly. Although the case is stamped and numbered, there is no indication of manufacturer. As can be seen from the label inserted in the case, the coil has two windings and two levels of sensitivity. One between terminals 2 & 3 giving a potential load of 2 amps deflecting the needle 45 degrees. The other between terminals 1 & 3 giving a potential load of 0.0062 amps deflecting the needle 45 degrees capable of detecting very small currents. The travel case has two terminal screws on the back face for connection to the working lines and internal wires can be placed on whichever terminals required on the galvanometer, this ensures the instrument is protected when working in the field. This example is in extremely good condition, even the travel case shows very little wear. EARLY GALVANOMETER by SIEMENS AND HALSKE circ 1890. This early mahogany and brass example carries the number 324476 and measures at the base 4 ½” x 3 ½” and stands 3 ½” high and would probably have been part of a complete telegraph set. The holders at each side are for in-line resistors which can be changed to increase or decrease the sensitivity of the instrument. It is in fully working condition although the needle is a little sticky at the ends of the swing. Field Galvanometer by Reid Bros. London N. No48 circ 1901. This early galvanometer marked no 48 and dated 1901, bears the broad arrow mark of the Ministry of Defence was manufactured by Reid Brothers of London who, by 1861, were the oldest and largest manufacturer of telegraphic instruments in Britain. The firm was founded by William Reid, senior (Member of the Institution of Civil Engineers, Member of the Royal Institution and Fellow of the Royal Geographical Society), who was born in Glasgow, Scotland, in 1798. His workshops manufactured the initial commercial instruments for W F Cooke and Charles Wheatstone, subsequently providing equipment for the Electric, European, Submarine, Magnetic and other telegraph companies in Britain. Reid also manufactured electric clocks and chemical telegraphs to Alexander Bain’s patents. This galvanometer is protected by 3 resistance coils 1 each of 2, 10 and 1000 ohms which could be brought into circuit by the peg seen at its rest position. Each side of the case opens to reveal 2 charts, one showing the amperes per degree of deflected swing with the 2 ohm coil pegged and the other showing the volt per degree of deflected swing with the 1000 ohm coil pegged. The dial also has a rotating needle stop which can be set to prevent over swing. It is complete and in great working condition. This is a moving coil, mirror reflecting galvanometer by Cambridge Instruments manufactured around 1950. The coil is suspended by two taut bands of silver or phosphor bronze with the small plain mirror mounted in the centre.This mirror was used to reflect a beam of light to a graduated scale. There is a zero adjustment attached to the top suspended taut band and because of the band being flat in profile, twists and therefore adjusts the position of the needle. No 24A Mk1. circa 1943. This example of a military issue horizontal galvanometer Type 24A Mk1 carries the number 160667 on the dial face and No 3171 and W.Y.0812 on the rear face. It has a resistance of 50.2 ohms and is complete with its leather carry case although the securing strap is broken this does not affect its function. It is in good working order and may have been used for other purposes other than for radio communication purposes like demolition. D’ARSONVAL GALVANOMETER by Nalder Bros & Co. Westminster circ 1898. This beautiful aluminium bodied d’arsonval galvanometer housed in a teak case with adjustable levelling feet. This example with a serial number of 29848 is in fully working condition with the exception of the levelling bubble which appears dry. This extremely sensitive instrument has a suspended coil which is protected, when the case lid is closed and the travel pin is depressed, supporting and lifting the coil and so protecting the fragile ribbon that the coil is suspended from. The top cap is removable and reveals the zero adjustment of the pointer. Nalder Brothers & Co was founded in 1884 by Francis Henry Nalder in partnership with his brother to manufacture electrical instruments in Brentford Middlesex. They moved to Red Lion Street, London in 1898 and then 34 Queen Street, London in 1903 after it was registered as a private limited company in 1899 and re named Nalder Brothers and Thompson Ltd after Ernest Thompson became a director. An advert dated 1898 has the d’arsonval galvanometer priced at £5.00 which in today’s money is about £500.00 so a very expensive instrument of the day. This galvanometer manufactured at the Telegraph Works in Silvertown. London circ 1920. It is good overall condition and has been testd and deflects with only 1 volt at either pole. This was used by engineers testing lines for the Post Office in conjunction with a Wheatstone Bridge. This is a monster of a Galvanometer measuring 9.5 inches diameter, 4.0 inches deep and weighing in at an impressive 6kg. It was claimed to have been an ex defence telegraph meter used in the testing and adjustments to telegraph relays and multi channel telegraph systems. Although the identification markings on the rear face of No21 GPO G37 234 would indicate it was in use by the G.P.O. probably at a main telegraph office and would have been used on large main line telegraph systems of single current, double current and multi channel systems. Manufactured by G.E.C. it is marked with a scale of 10-0-10 milliamperes with a resistance of 10 ohms this gives a full scale deflection (F.S.D.) of 0.100 volts. It is in great condition for its age and in fully working condition. This is a beautiful Milli Amp Meter dating from around 1880. The pointer is mounted on an iron dome which balances on a replaceable and adjustable point. This point is housed in a thin collet which is screwed in from the underside. When suspended, the iron dome is surrounded by a copper ring which is housed in a wooden turned ring. The cotton covered wire coil windings are wrapped around the timber. Although marked as a Milliamp meter there are no stops at the scale end and no hair spring return. This meter has, what appears to be, three positions where levelling screws could be mounted although there is no level bubble. At rest, the pointer is set to zero on the scale by releasing the lock thumb screw and rotating the Vulcanite body until they line up. When current is detected the pointer moves in the direction of current flow. There is also a position marked 1:10 that is connected to a tapping off the coil allowing the meter to be used on two scales. The scale itself is graduated to +/- 35 Milliamps although this, I suspect, is more an indication of amount of current. There is no evidence of a manufacturers mark but is certainly well made and a lovely meter capped with a domed glass face. Elliot Brothers (London) Limited Milliamp Meter circ 1916-1930. This is an early desktop single coil milliamp meter by Elliot Brothers (London) Limited No D55497 and has a deflection of 7.5 mill amperes D.C. either side of the central rest position and was manufactured after 1916. It has a black painted metal casing with the manufacturers plate mounted just below the main dial. Elliot Brothers (London) Ltd became a limited company in 1916 so this instrument can be dated after that date. There are only two terminals on the back face indicating it is a single coil meter used on simplex telegraph systems. It also has the remains of a painted mark of TL2 SIGN??? but further research is required to establish the missing parts. This meter has been tested and works fine. Chauvin Arnoux Instrument Maker of Paris, France. Founded in 1893 by Raphaël Chauvin and René Arnoux, Chauvin Arnoux has had a considerable influence on the development of measurement technology. A long and prestigious list of inventions, such as the Universal Tester (the precursor of the Multimeter) and the ammeter clamp, bears witness to this fact. Throughout the 20th century, Chauvin Arnoux filed more than 350 patents and trade marks. These last few years have been marked by the gain of some impressive brand names such as Metrix, Pyro-Contrôle, Enerdis, Oritel and Radio Contrôle. Chauvin Anroux Ltd continues to be a family owned business and is subsequently managed with the same business and work ethincs that are attributed with being such. The company was founded by René Arnoux and Raphaël Chauvin. The current Paris premises stands on the original site. Invention of the magneto ohmmeter. In 1923, measurement became independent of the magneto's rotation speed. With André Arnoux, the founder's son, at the head of the company, industrial development takes a leap forward in Paris. Invention and patent application for the 'Contrôleur Universel', the forerunner to the Multimeter. Despite this patent, the invention was to become copied throughout the world. This early instrument dating from around 1900 – 1910 is in good original condition. This is a combination meter measuring on various scales depending which terminal the negative line is connected to. The side terminals go to tapping’s on the internal resistance coil and the positive line goes to the terminal on the top. This example is in fully working condition and is complete with calibration slips from the Inspector of Royal Engineer Stores (I.R.E.S.) Woolwich Works dated 26 July 1920 which indicates that this instrument was used by the British Military. Given this is a French instrument it is unclear when it came into service with the British Forces, it may have been acquired before or after the Great War. The leather carry handle is also original and intact. The following information on the I.R.E.S. has been extracted from the The Aquilla Association and their website www.aquilla-association.org which shows photos of their Wireless and Electrical sections from around the time this instrument was calibrated. In 1889, a Captain H.E.R. Tyler was appointed to the post of Inspector of Royal Engineer Stores (IRES). Based at the Woolwich Dockyard, the IRES assumed responsibility for the custody of the patterns used in the manufacture of all military equipment and preparation of detailed specifications to be applied in its manufacture, building on a system that had been successfully introduced by the Royal Engineers in 1871. A major change was that now, contracts for the manufacture of military equipment were issued to suppliers only after they had been audited by the IRES. By 1900, the IRES had grown to a team of 50, under the command of Captains Wade and Lewis of the Royal Engineers. Most of the inspection staff were ex-Warrant Officers and Senior NCOs of the Royal Engineers. Working conditions were somewhat arduous; 48 hour weeks with no paid annual leave, canteen or tea breaks, for a weekly wage of 38 Shillings, rising to 45 Shillings for more experienced staff. The inspectorate at the time, although a civilian department of the War Office, was intimately linked to the British Army. The sidings at Woolwich Dockyard, where it was based, were where troops and equipment were dispatched to the Boer, and later the First World Wars. The latter part of the 19th and early 20th Centuries witnessed rapid advancements in technology, in particular military aviation and wireless communications. In 1903, the IRES assumed responsibility for electrical equipment and expanded once again, moving from its “rat infested” buildings to new purpose-built ones at the Woolwich site. Around this time, the post of Inspector of Royal Engineers Stores was upgraded to Chief Inspector of Royal Engineer Stores, with a rank of Lt. Colonel. Multi Meter designated Instrument Testing No 1 manufactured by Vic circa 1943. This meter manufactured and marked Vic is dated on the gauge 1943 along with a M.O.D. broad arrow and an internal resistance of 250 ohms on a moving coil. It was used by linemen in the Army and is still in full working condition. On the back face is a set of instructions for use indicating variations of tests being able to be carried out with this instrument. The ohm scale is graduated to 5000 ohms, the volt scale is divided, one to 1.5 volt and the other to 3.0 volt and the current scale is graduated to 60 milli ampere. It is in good overall condition although missing its carry strap. A wonderful instrument manufactured by Siemens Brothers & Co Ltd of London between 1880 and 1914 and is encased in a brass case on a mahogany base. The meter has a total deflection of 10 volts or 10 milliampres but could be extended by use of shunts and resisters so as to protect the movement. The buttons on the top front edge would be depressed allowing the meter to be read with either volts or amps depending on the test being performed. This is marked on the brass case and on the front face of the mahogany base with No 75, the model number of the instrument and is in fully working condition. This Volt and Ampere meter named the Mavometer was made by German firm P. Gossen & Co., Erlangen, Bayern. and was marketed in The Netherlands by Charles Velthuisen in The Hague. The pointer has a jewel bearing and a white measurement button which is depressed to read the scale in measuring mode. It has a Bakelite case and cardboard scale (0-50 and 0-75) and has a mirror scale under a glass window. On the back face is a full set of data on measuring with this instrument. These meters were made from 1928 until the end of the 30s. With the meter came a number of measuring resistances, so that the meter can be adapted to the value that has to be measured. These resistances can be fixed under the bottom terminals of the meter. Reading takes place by multiplying the value on the meter by a constant that corresponds to the measuring resistance. Various fittings were made for this meter. For example the Maweco-Zusatz for measuring alternating current. There is also a module with several built-in measuring resistances, which can be chosen by a button. De Luxe Dix-Onemeter. Leslie Dixon & Co. s/n 22384 circ 1928. The following is an extract from an article published in the British Vintage Wireless Society bulletin Vol. 14 no1 dated march 1989 and written by Colin MacKinnon of the Historical Radio Society of Australia. The answer is now clear when you see it next to a Mavometer produced by Gossen & Co in Germany. It is a rebadged Mavometer supplied in the same lined box and with the paper label instruction diagrams on the rear a near copy pictorially and at a cost of £150.00 in today’s money they weren’t cheap. As the Onemeter only operated with D.C. there were also A.C. multipliers blocks available. They comprise three models: No1, Dix-Wevo, 6 ranges A.C or D.C., 5 V to 500 V; No2, Dix-Wema, 6 ranges from 5 mA to 250 mA; No3, Dix-Weamp, 5 ranges from 0.5A to 10A. Each were priced at 85/- in the Wireless & Electrical Trader dated October 16, 1937. The above images show a pair of vintage G.P.O. detector No.2s one marked AQ12/235 GPO with the other marked 1 T.D. along with the broad arrow placing it in service with the armed forces. This is the first military version of this instrument I have come across and has an engraved chromed scale rather than a paper scale. The Detector No 2 is a moving coil volt / multi meter of robust construction contained in an aluminium case, and originally provided with a leather case so arranged that the instrument may be used without withdrawal. The coil is placed at an angle to instead of in the line joining the soft iron pole pieces. This gives extended range of measurements. The moving coil has a resistance of 60 ohm, and un-shunted gives a full scale reading with 10mA and with the 1/50th and 1/5th shunts with which it is fitted 500mA and 50mA. It can also be used as a volt meter reading 0 to 5 volt and 0 to 50 volt. This detector is documented in the Post Office Engineering Department Technical Pamphlet for Workmen PW-A6 dated August 1934 and Telegraphy by T.E. Herbert dated 1930. This a vintage G.P.O. detector No.4 model 55 moving coil test / multi meter marked and dated on the leather case flap just under the latch B.H.G. 1947 and on the base H.F.R. 55 No1A. Although dated 1947, this detector is documented in the Post Office Engineering Department Technical Pamphlet for Workmen PW-A6 dated August 1934. It is described as being regarded as being an improved Detector No.2 being lighter more compact and designed so that tests may be carried out with a greater degree of accuracy. A full scale deflection is given with 10 mill amperes of current in the moving coil. The ranges covered are 0-50 or 500 mill amperes and 0-5 or 50 volts and is switchable with the rotary switch on the top face. This instrument could also have extended ranges of measurements by use of various resisters and shunts which would have been carried in a separate leather case. Inside the top flap and on the back of the instrument are charts indicating which of these are to be used and on which terminals for various tests. The leather case is in good aged condition and the stitching is still intact, a nice piece of telecom history. These two portable test sets are housed in polished boxwood boxes and are really nicely manufactured. The fig 119 is a version having 8 terminals where fig 118 would have had 10 terminals. This instrument is capable of measuring voltage with a metered range of 7.5v, 150v and 300v and amperage ranging from 3mA, 15mA, 75mA and 7.5A. It is also capable of measuring resistance from about 25 ohms to 2 mega-ohms for close approximation suitable for most purposes by way of utilising either the L.T. of H.T. battery voltage and carrying out the calculation. The fig 120 also has 8 terminals and is capable of measuring voltage with a metered range of 8.0v and 120v and amperage ranging from 3mA, 12mA, 120mA, 1200mA and 8.0A. It is also capable of measuring resistance from about 25 ohms to 2 mega-ohms the same as fig 119. A. H. Hunt (Capacitors) Ltd. was founded in 1901 and had factories in Wrexham and Yarmouth, though earlier they operated in Croydon. They were a major manufacturer of capacitors but were taken over by Erie Electronics Ltd (of Great Yarmouth) circa 1969. At that time Hunts had factories at Wrexham and Wandsworth in London, Hunts products were then re-branded Erie. Erie (UK) was a subsidiary of Erie USA. Erie (UK) was bought by ITT Components Group Europe circa 1975 (they also bought Daly of Weymouth). Another re-branding of former Hunts & Erie products as ITT followed. By the late 1980s, it would appear that the former Hunts plastic film capacitors business was closed down or scaled down drastically and sold off. Certainly the Wandsworth site closed. Linesman Test Set by Telegraph Works, Silvertown. London No. 189 circ 1900. This linesman test set No 189 manufactured by Telegraph Works, Silvertown. London dates from around 1900. This is a beautiful set in a mahogany box which has the number 190 sign painted on the outside of the lid and finished inside in padded purple felt held closed by two hook latches. It has a mounted galvanometer, 2 battery terminals and 2 bridge terminals. The bridge consists of 12 pegged coils ranging from 1 ohm to 400 ohm giving a total bridge resistance of 1110 ohms. It also has 2 other pegs that are marked X (multiply) and / (divide) both by 10 next to the battery terminals presumably allowing supply voltage to be adjusted making this a very versatile test set. This example is complete with all pegs and is in great working condition, the only flaw is a slight chip in the glass of the galvanometer on the top edge but it is very small. The galvanometer is protected during travel by a brass plunger mounted on the inside of the lid which depresses a needle lift bar that lifts the pointer and clamps it in a safe position when the lid is closed. Linesman Test Set by Telegraph Works, Silvertown. London No. 1004 circ 1922. This linesman test set No 1004 manufactured by Telegraph Works, Silvertown. London dates from 15th September 1922 as is indicated in pencil under the carry handle on the lid of the case. This is a beautiful set finished inside the lid in padded purple felt and lockable by means of the rotating lockable latch assembly on the front face. It has a centrally mounted horizontal galvanometer and test key to the front, protected by various shunts of 5, 20, 100 and 500 ohms selected by use of the selector peg. On the left hand side is an insulation test facility and a 50,000 ohm coil resister again selected by a peg, a battery can be connected on the forward right hand terminals. On the front left hand side are the terminals for the line and earth of the circuit to be tested. The galvanometer is protected by means of a brass plate mounted near the hinged edge of the lid that lifts the pointer and clamps it in a safe position when the lid is closed. Test Set by Kelvin & James White Ltd No. 367 circ 1900 - 1913. This test set No 367 manufactured by Kelvin & James White Ltd under the patents of Lord Kelvin. Dating this set is quite precise as this company was formed in 1900 when Lord Kelvin resigned from his university chair and became a director of the newly formed company after acquiring the business of James White. In 1913 the company changed name to Kelvin, James and Hutton Ltd so dating this test set between these dates. This is a beautiful test set having a mounted galvanometer to one side and two rotary configuration switches opposite. The total resistance rating of the galvanometer coil is 50,000 ohms but tapping’s can be switched in, using the rotary switches, allowing galvanometer shunt resistances of the following divisions of 1/499, 1/99 and 1/9 allowing detection of voltages as low as 10 -11 (0.0000000001 of a volt). The Galvanometer has a twin rod magnet set on the top face which when rotated makes it possible to set zero precisely, this allows the operator to counteract outside magnetic forces. There is no levelling option on the case but it could be mounted on a tripod which itself would probably have a levelling capability, this would be necessary as the needle is extremely sensitive. The whole unit is housed in a lockable mahogany case with a clip inside the lid which I presume is for housing some form of tool or spare part used for setting this set. An identical set, numbered 434 is documented as being used on the White Star Lines “Olympic”, Titanic’s sister ship in 1913 with another on display at the Hunterian Museum & Art Gallery, University of Glasgow. 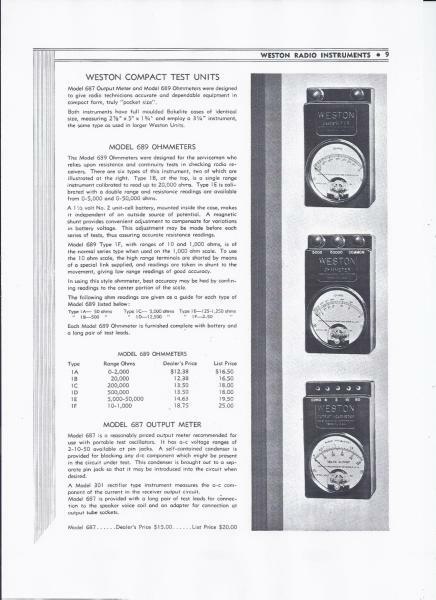 Weston’s Direct Reading Volt Meter serial number 11882 Patented Nov 6 1888. This is a beautiful desktop Direct Reading D.C. moving coil Volt Meter with 3 ranges manufactured by Weston Electrical Instrument Company of Newark, New Jersey, U.S.A. Range 1 < 5 volt, Range 2 < 150 volt and Range 3 < 750 volt. Although the scale only has a range up to 150 volt, when range 3 is used then the reading needs to be multiplied by 5. The positive lead is placed on the right hand terminal marked + and the negative to the range to be used, the meter is activated when the test button is depressed. This meter is in full working order and is accurate on all three ranges. It is in wonderful condition given that it dates from 1898 as shown by the latest applied patent on the front plate. It comes complete with its wooden storage and carrying case although the leather carrying handle has been replaced. Weston’s Direct Reading Am-Meter serial number 6553 Patented Nov 6 1888. This is a beautiful desktop Direct Reading moving coil Am-Meter manufactured by Weston Electrical Instrument Company of Newark, New Jersey, U.S.A. Range 0 – 15 amp graduated in divisions of 0.1 amp. The positive lead is placed on the upper right hand terminal marked + and the negative to the terminal below that on the right hand side. This meter is in full working order and carries a label on the top edge showing it was used at the London County Council Hackney Technical Institute, Engineering Dept. with a No. 22. 51. 02. It also has the remains of a painted number A2 on the top edge of the red steel cover. It is in fair condition given that it dates from between 1928 to 1947 and probably used by a number of students during their engineering training. The Hackney Technical Institute Eastside Academy was built in 1837 to provide an education for girls in the parish. In 1897 the buildings were acquired to form the central site for L.C.C. (London County Council) Hackney Institute. In 1928 Hackney Institute then became L.C.C. Hackney Technical Institute and then in 1947 became the Hackney Technical Collage. Now converted into unique loft apartments, the property is now one of the most popular residential developments in Hackney, located in the fast growing Dalston Lane. Weston’s Direct Reading Micro ammeter Model 1 serial number 53699 Circ 1930. This is a beautiful desktop Direct Reading D.C. moving coil Micro ammeter manufactured by Weston Electrical Instrument Corporation of Newark, New Jersey, U.S.A. The coil measures at 185 ohm and has a maximum deflection of 0.001 amps with graduations of 0.000010 amps. So will read extremely small current with only 0.0000054 volt D.C. giving maximum deflection. The positive lead is placed on the right hand terminal marked + and the negative placed on the left hand terminal marked -. This meter is in full working order and is accurate. It is in wonderful condition given that it dates from the 1930’s although the Model 1 was first patented in 1888 this later model with the fully Bakelite base places it in this time period. It comes complete with its leather storage and carrying case complete with key although the leather carrying handle is broken and overall is in poor condition but has certainly protected the enclosed meter as intended. number 590 dated Jan 8th 1912. This is a Standard Portable Alternating and Direct Current Volt Meter manufactured by Weston Electrical Instrument Company of Newark, New Jersey, U.S.A. It is housed in a mahogany case with removable lid of which in the inside face is the original certificate dated Jan 8th 1912. It has 3 stated patent dates that of Nov 11th 1890, March 8th 1892 and June 28th 1892. And indicates that it has a resistance of 150 volt coil 2792 ohm at 70 Deg. F. and can be relied upon within ¼ of 1 percent. This is an example of one of the first meters Weston manufactured and is in full working order it is in wonderful condition given that it dates from 1912. Since his early days in electroplating, Weston had been concerned about the lack of accurate, practical devices for measuring electrical parameters so in 1887, having withdrawn from the generator and lamp business, he established a laboratory, and the following year Weston Electrical Instrument Company began trading and in 1888 he developed the truly permanent magnet. He also developed two important alloys, especially for electrical measurement: Constanta having a negative temperature coefficient; and Manganin, having an extremely low temperature coefficient, Patents No. 381304 reissue No. 10994 and Patents No. 381305, reissued No. 10945 in 1888. In 1888 he developed a practical precision, direct reading portable instrument to accurately measure electrical current, a device which became the basis for the voltmeter, ammeter and watt meter. The Weston Standard Cell, developed in 1893, was recognized as an international standard and was used by the National Bureau of Standards for almost a century to calibrate other meters. His company, Weston Instruments, produced world famous precision electrical measuring instruments including volt, amp, watt, ohm, and HF meters, current /potential transformers and transducers. The model 689 Ohmmeters were designed for the serviceman who relies upon resistance and continuity tests in checking radio receivers. There are six types of this instrument, this example being the Type 1F with ranges of 10 and 1000 ohms, and is of the normal series type when using the 1000 ohm scale. To use the 10 ohm scale, the high range terminals are shorted together by means of a special link which is supplied. The readings are taken in shunt to the movement, giving low range readings of good accuracy. A 1.5 volt No 2 unit-cell battery, mounted inside the casing, makes it independent of an outside source of potential. A magnetic shunt provides convenient adjustment to compensate for variations in battery voltage. Each Model 689 is supplied complete with battery and a long pair of test leads, this example also has its leather carry case and all parts are in good overall condition. The illustration shown above is from the Weston Catalogue dated April 1934. Weston Electrical Instrument Co. Newark. N.J. U.S.A. Model 280 Garage Type Volt-Ammeter No 34114 circa 1901 – 1930. This Weston model 280 volt-ammeter dated 21 July 1919 was originally part of a kit for testing early automobile electrical systems. The kit would have contained a meter, 3 shunts for testing current, and a 46 page manual in a leather carrying case. It carries the following patent information. Jul 10,94. Nov 20,94. Jul 20,95. Oct 4,98. Jul 16,01. and other patents pending. This instrument is lightly engraved J.P. Kemp. 62 Broad Street. Birmingham 21-7-19 and towards the top, 3v full scale = 20 M/Amp. It is in great condition for its age and is in fully working condition. It has a positive terminal in the top right hand corner and a button marked ‘press for voltage’ in the mid right hand edge. Along the bottom edge are three terminals with 3 volt, 15 volt and 150 volt markings. Along the top edge are three terminals with 3 amp, 15 amp and 30 amp markings all of which the Negative line would have been connected depending on what circuit you were testing. Weston Electrical Instruments Co Milliammeter Model 264 Type 1-A. circ 1901-1920. This is a desktop Model 264 Type 1A twin coil milliammeter by Weston Electrical Instruments Co. Newark N.J. U.S.A. No 11985 has a deflection of 175 millamperes D.C. on either side of the central rest position and was manufactured for and supplied to the Western Union Telegraph Company. The dial of this meter bears five patent dates, from 1888 to 1901 with "others pending". It is also marked W.U. TEL. CO (Western Union Telegraph Company) type 1-A. The black painted metal casings overall dimensions are 61/4 x 41/4 x 21/2 inches deep. There are three terminals on the back face, the centre one is marked with a + so the negative up and down lines would go to the other terminals and would have been used on Duplex telegraph systems. This meter has been tested and works fine. Weston Electrical Instruments Co Milliammeter Model 264 Type 3-A. circ 1901-1920. This is an early desktop Model 264 Type 3A single coil milliammeter by Weston Electrical Instruments Co. Newark N.J. U.S.A. No 2399 has a deflection of 50 milliamperes D.C. either side of the central rest position and was manufactured for and supplied to the Western Union Telegraph Company. The dial of this meter bears five patent dates, from 1888 to 1901 with "others pending". It is also marked W.U. TEL. CO (Western Union Telegraph Company) type 3-A. The black painted metal casings which has been rubbed back to the brass on the front face has overall dimensions of 61/4 x 41/4 x 21/2 inches deep. There are only two terminals on the back face indicating it is a single coil meter used on simplex telegraph systems. This meter has been tested and works fine. This example of a large Wheatstone Bridge with Galvanometer manufactured by Siemens Brothers & Co Ltd with a serial number of 2671 dates from around 1910. It has a total balancing resistance capacity of 10,000 Ohms with available pegged increments of 1 Ohm in banks of units, tens, hundreds and thousands making this a very versatile and sensitive unit. It has a standard key set up with one for battery and one for the galvanometer which in itself has a total deflection of 40 either side of the zero rest position. Mounted in the case, on the left hand side is a magnetic bar allowing zeroing of the galvanometer by resting the bar on the top face thus deflecting the needle. The lid detaches and has on the inside a circuit diagram showing the wiring of the bridge for setup purposes. This example is complete and in great working condition and is all housed in a polished mahogany case which is lockable through a rotary latch on the front face. The Wheatstone Bridge was originally developed by Charles Wheatstone to measure unknown resistance values and as a means of calibrating measuring instruments, voltmeters, ammeters, etc. It was also used widely in the testing of telegraph lines both for damage and for being able to calculate line resistance for matching to other telegraphic equipment. This beautifully complete Wheatstone Bridge manufactured by Elliot Brothers, London circ 1900 – 1910 carries the number of 1339. It also bears the broad arrow, a sign of government ownership, used by the Ministry of Defence and is just visible under the battery key, so was in service during either the Boer War of 1899 – 1902 or the 1st World war of 1914 -18. The serial number and War Department stamp is also on the lid of the carry case. Looking closely at the design I would imagine it was the Boer War as the reversing switch at the end is of the earlier pegged design rather than the later rotary switch seen on later versions. This example, complete with carry case and shorting pegs is in full working condition. Resistance Bridge marked Mk 1V No 2016 Silvertown 1915. A nice resistance bridge consisting of a polished wood case with Bakelite panel, brass plugs for resistance selection and brass terminals. Designed for line testing, two 10 ohm arms and one variable 100 ohm arm. Platinoid BS ohms @ 15.50 C working, marked Silvertown 1915. This would have been the Telegraph Works at Silvertown, London one of the main British Post Office Factories. It is also marked with a Ministry of Defence broad arrow it confirms it was used in military service. The top is made of thick ebonite supporting undercut brass blocks shaped to accommodate sixteen interchangeable brass shorting plugs which have ebonite handles. The brass blocks are connected to resistance coils of thick wire to reduce the effect of heating when passing large currents. The coils are of platinoid resistance wire, the resistivity of which does not change appreciably with small changes of temperature. The accuracy of such a resistance standard may be taken as 0.30%. Resistance is inserted by removing a plug, which, when in place, short-circuits the resistance. This device is configured as a Wheatstone bridge, with terminals and key switches for a battery and galvanometer. An unknown resistance can be clamped between the terminals provided and the bridge balanced (when no current flows through the galvanometer) with an equal resistance of un-shorted coils between 0.1 and 100 ohms. A rheostat is a variable resistor used in situations where current is required to be controlled. In 1925 the G.P.O. Rheostat “ C “ was in widespread use but by 1930 it was obsolete, replaced by the G.P.O. “ D “ which was, by then, the standard pattern. This form has two sets of wire wound coils each coil being wired to a contact stud, there are two radial arms each consisting of strips of phosphor bronze, bent to bear down upon the circular brass contact blocks. One set of coils ranges from 40 to 400 ohms in 40 ohm steps, the other set ranges from 400 to 4000 ohms in 400 ohm steps. In addition to these coils are 3 extra coils of 400, 20 and 10 ohms switched in and out by use of a shorting plug giving a total resistance of 8430 ohms. A rheostat “ F “also having 1, 2, 3, and 4 ohm coils is provided for use with the bridge megger. A rheostat “ K “is a rheostat “ D “but with an extra 4000 ohm coil and plug. The rheostat “ J “ has two dials 5 to 50 ohms and 50 to 500 ohms with three coils each of 250 ohms and three plugs. It is used as the control resistance in the motor circuit of the Distributor Baudot No3. This example of a Rheostat “ F “ dating from 1930 is in fully working condition and measures incrementally over each coil although the contacts could do with cleaning to give accurate measurements, also it is missing six of the seven plugs. Universal Shunt manufactured by W.G.PYE & Co of Cambridge. England. The arrangement of shunts with galvanometers had a great disadvantage that each set must be specially designed for the particular resistance of the instrument with which it is to be used. This defect was met by the invention of the Universal Shunt by Ayrton and Mather. This shunt may be applied to any galvanometer, irrespective of its resistance and still give equally accurate results. The Universal Shunt has a total subdivided resistance of 10000 ohms and placed directly across the terminals of the galvanometer. There is a radial arm moving over a series of contacts each being in connection with resistance coils giving a variable amount shunting resistance. Failure to fit the correct shunt to the galvanometer could damage the instrument so this shunt, having resistance of variable values, makes this operation a lot safer. This example was manufactured by W.G. Pye & Co. of Cambridge, England. And carries a serial number of 5735 and dates from 1920.